Very comfy bed. On par with the dream beds at the Westin Bayshore in Vancouver at a fraction of the price. Quick post before I board a flight to Tawau in Malaysia. 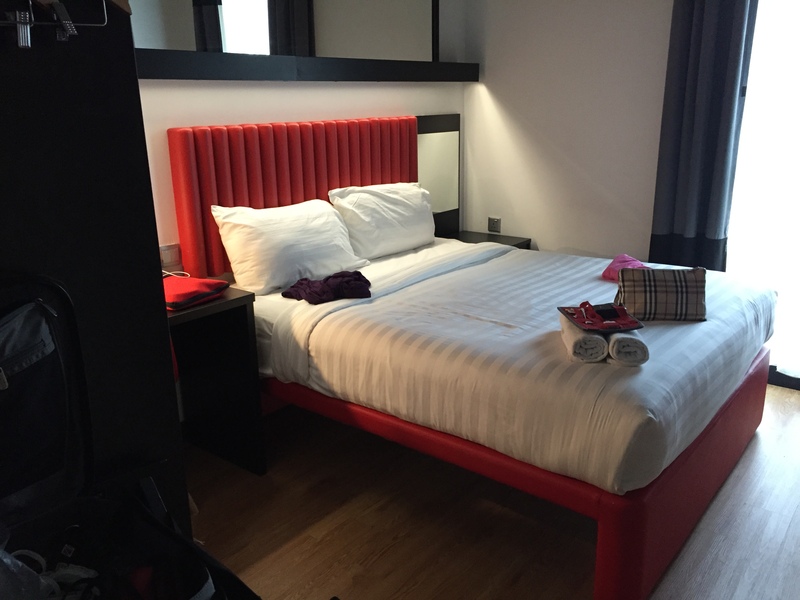 I’ve found my new love in budget accommodation and it’s called Tune Hotels. This one, near door to Kuala Lumpur International Airport 2, is walking distance from terminal 2 and a three minute train ride (cost under $1 CDN) from terminal 1. Air Asia either owns or has a financial holding in Tune Hotels. They’re popping up all over the world. I flew Air Asia a few years ago from Bangkok to Denpasar, Bali. A few hitches with check-in, but otherwise a great experience. This room, for which I paid $64.49 CDN is fantastic. Small, yet everything I need. Shower, toilet, air conditioning and fan, sink, bed, safe, desk and excellent wifi. It also has a honking big TV. Also, clean beyond belief. Great desk staff. The bed is so comfy I slept 11 hours. Even the noise in the hallway didn’t prevent a night of amazing slumber. There’s a 24 hour 7-11 next door to the lobby. And, Air Asia check-in kiosk. I’m in heaven. I’ll be staying here again on my way back to Canada in a few weeks. Next stop, a week of scuba diving near Sipidan Island. Yes, that’s underwear drying. Great, comfy. Best travel undies EVER. ExOfficio. 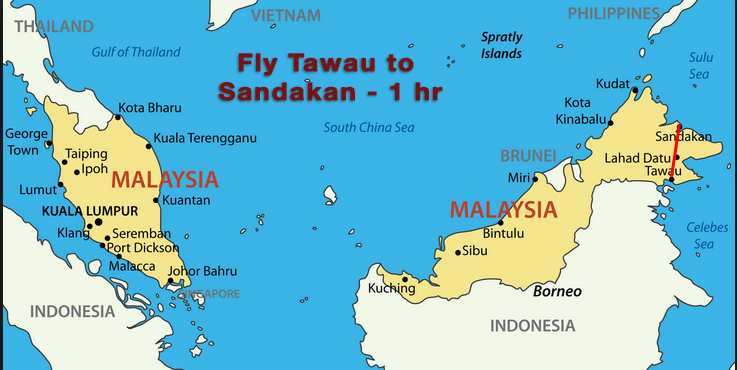 Flight to Sandakan and the start of my wilderness adventure. Along with kittens, koalas and sharks, orangutans are my favourite critters. It would have been insane of me to travel all the way to Malaysia and not check out Orangutan country. 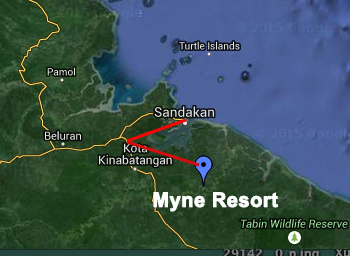 So, following my week long diving trip to Mabul Island, near Tawau, I’ll head to the Myne Resort, near Sandakan for four days/three nights of wilderness fun. Day 1: Pick up from Sepilok Nature Resort between 0845 -­‐ 0850 hrs and transfer overland to Sepilok Orangutan Rehabilitation Centre. Upon arrival, proceed with the documentary video show (30 minutes) before witnessing the feeding time of the orangutans at 1000 hrs. Then transfer overland to Myne Resort, which will take approximately 2.5 hours. Upon arrival at the resort, check into your accommodation followed by lunch at the resort’s restaurant. At 1530 hrs, have your coffee/tea break with local snacks. At 1600 hrs, take a river cruise in search for wildlife along the Kinabatangan River. Good chance to see and spot numerous types of birds and wildlife. Return to the resort at about 1800 hrs to freshen up and followed by dinner at 1900 hrs. Day 2-3: Early morning at 0600 hrs, head to the restaurant for light breakfast before proceeding with the early morning river cruise, which is scheduled at 0630 hrs. Return to the resort at about 0830 hrs for breakfast. Free at leisure. At 1030 hrs, proceed with the jungle walk to the Historical Merbau Tree or the Bird’s Watching Tower. Lunch will be served at 1300 hrs and free at leisure. At 1530 hrs, have your coffee/tea break with local snacks before the afternoon boat cruise at 1600 hrs. Return to the resort at about 1800 hrs to freshen up and followed by dinner at 1900 hrs. Day 4: Breakfast at 0800 hrs and by 0900 hrs, check out from resort and transfer overland for visit to Gomantong Caves. Then, proceed to Sandakan for lunch at local restaurant. After lunch, continue your trip with the Sandakan City Tour prior to drop off at Sandakan Airport for flight departure at 1815 hrs. Can’t wait. Anyone know who in Vancouver sells leech socks? I’ll be staying at the SMART resort on the island of Mabul. Supposed to offer high-end accommodation. The resort has bungalows on the water, but a wee bit out of my price range. I’ll be in a chalet near the beach. SMART will be my home for a week. In order to dive Sipidan, which restricts the number of divers it allows on site each day to 120, I had to book a certain number of days at a specific hotel room price point. And, that only guarantees one day of actual Sipidan diving. 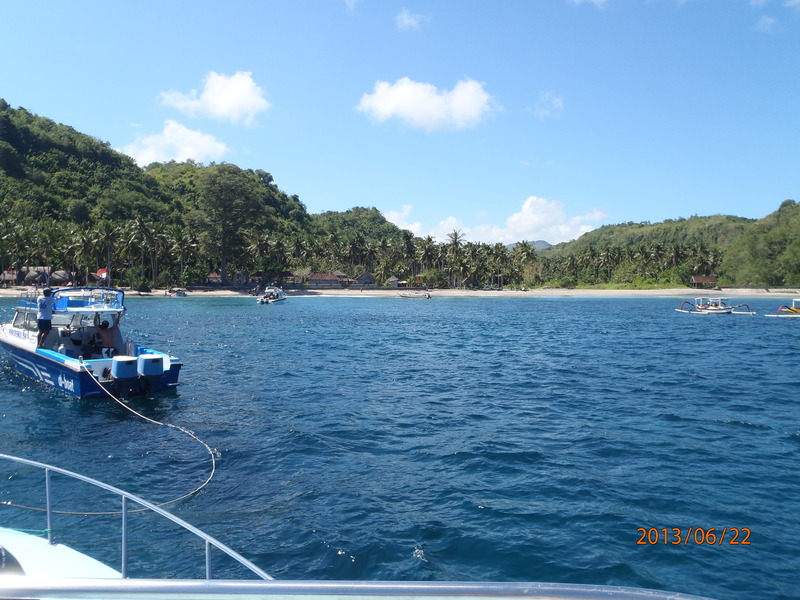 But, there are amazing unrestricted dive sites outside of the restricted area for the rest of the stay. 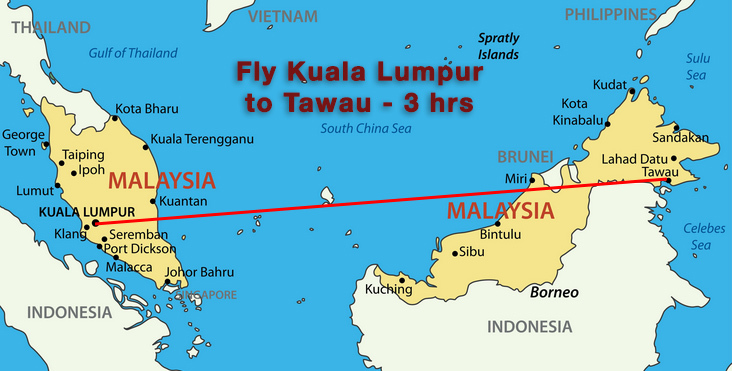 Air Asia flight from Kuala Lumpur to Tawau: 225.73 MYR = $75.00 CDN (Yes, I know Air Asia did crash a plane earlier this year. I flew the airline to Bali two years ago. It was great. I’ve also got a flight booked on Malaysia Airlines, which lost two planes in recent years. Not worried). 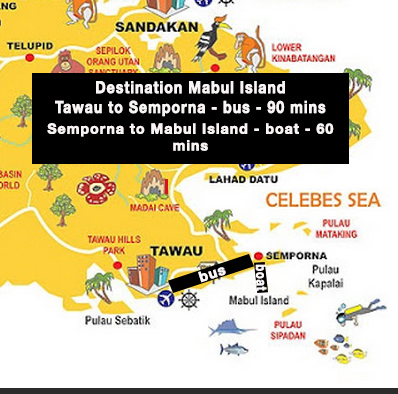 Package Includes: Transfer between Tawau -­ Semporna Jetty -­ Sipadan-­ Mabul Resort -­ Tawau by van and speedboat, food and hot beverage while at the resort (excluding alcoholic, fruit juice and carbonated soft drinks). Three boat dives per day with divemaster around Mabul, Kapalai and Si Amil islands including use of tanks with air, weights and weight belt. Unlimited diving at Mabul’s House Reef and 1 Day Sipadan Diving. For someone accustomed to a $30USD a night room in Roatan, Honduras, this is a bit much. At this price point, I likely won’t be able to/want to do this a second time in the future. I’ll be taking pictures and videos so I have lots of memories. Next week: Tank meets Orangs. Diving near Nusa Pedina, east Bali. Bali is one of those places people long to visit. I didn’t. Seemed a long way to travel and a lot of money to get there. Turned out it wasn’t as expensive as I expected, thanks in part to a 25% discount voucher from Air Canada. Glad I went, so much that I’ve got plans to return to Indonesia next year (fingers crossed). Quiet and peaceful (when you’re away from the traffic). Friendly, helpful people (hotel, restaurant staff, scuba diving staff). Beaches so-so. More rock than sand. My best ever day of diving (and I’ve done nearly 200 scuba dives). Amed beach, Bali. Can you believe I dove from one of these outriggers? Business class travel to Malaysia in the summer of 2015. Using Aeroplan miles = 155k (ouch). As you can see, at roughly 114k miles, I’ve still got a long way to go. Here are some of the things I’ve done since my last post to rack up the miles. Gas up at Esso. No exceptions. Flew to Cuba on Air Canada with a connection (going) and layover (returning) in Toronto. Lost some sleep and time, but earned an extra 3000 miles. Would normally have flown direct from Vancouver via Westjet, Air Transat or Sunwing. Booked two trips on United Airlines, where I normally would have flown another airline. United flight miles can be converted to Aeroplan miles. Here’s the problem going forward (I know, first world problem. I don’t take for granted for one second how fortunate I am). It can be hard to get Aeroplan seats on planes. I have enough points now (90k) for economy travel to Kota Kinabalu. I could book an economy seat many, many months in advance and probably get the days of travel I want. I can keep growing Aeroplan points in the hope of flying business class, with the hope there will still be Aeroplan seats in business class available when I want to travel.